Guided Rental Open in January! We have revised our Longarm Rental Program! Please review the new program to your right! The new program offers more guidance, which we hope will help you finish more quilts! Rental date/time options will be available on our new Class Schedule on January 1st! Looking for a Q24 Refresher? Head over to the Q24 Support page for a refresher video on loading and navigating the Bernina Q24 Longarm Machine! Welcome to the Seams Like Home Guided Rental Program! Want to quilt your own quilt? The SLH Guided Rental program will help you complete your own quilts, while having someone on hand to troubleshoot and assist with basic set up. Unlike our previous program, there will be no certification required – however, there will be some Longarm Prep classes offered regularly which are strongly recommended. These courses will help you learn the proper way to prepare your quilt for longarm quilting, which will be key to your success. Guided Rental will be run like a class, meaning you choose from the available times, gather your supplies and show up! Your guide will help you load your quilt, thread the machine and trouble shoot if you get stuck. 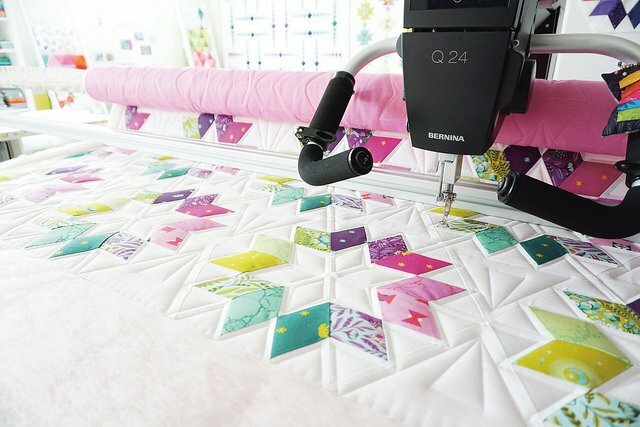 You can choose from Free-Motion, Ruler work, Pantograph or Qmatic (Automated Quilting) Quilting. *Size limitations may apply to Qmatic option. When is Guided Rental Available? Guided Rental times are scheduled just like any other SLH Class. You can choose from the available date/time options. There will be a variety of options – day time and evening, and possibly even weekends! To view the date/time options you can visit our Longarm Class Section on our Classes page. The cost is $90 for a 3 hour time block or $120 for a 4 hour time block. You will need to bring your quilt top, batting and backing – top and backing freshly ironed, backing pressed, squared and at least 4 inches bigger on each side than your quilt top. I recommend either batting by the yard or opening your packaged batting a day or two ahead to let the creases rest out. What if I don’t finish my quilt in my session? In order to insure that you finish your quilt on time, we only accept twin size or smaller during our guided rental session. All effort will be made to get your quilt finished during your session, but if that is not possible you will need to sign up for another guided session. We will help you reload and continue during the next session. *Qmatic use will be limited to specific designs that will help insure that you finish your quilt in your scheduled time block. With this type of quilting, it is much harder to reload your project once quilting has begun. How do I prepare for Guided Rental? We highly recommend taking some of our “Longarm Prep” courses. These will be offered multiple times during the Class Session to help you learn some longarm basics such as: quilt preparation techniques, lectures on thread, batting and basic troubleshooting topics. What if I took the Longarm Certification already? If you have previously taken our Longarm Certification and have been back to rent on a regular basis (at least once a month) you may be eligible for “Unguided Use” of the Longarm. However, in order to quality for this type of rental you must be comfortable running the machine primarily by yourself. If you qualify for Unguided Rental, it will be noted in your customer file – otherwise you will be required to sign up for Guided Rental time. *Approval for Unguided Rental is handled on a case by case basis. If you have further questions or concerns please feel free to contact us, we will do our best to answer them. You may email us at info@akseams.com or call the shop at 907.677.8790.